Screen-printed electrodes (SPEs), which are used as economical electrochemical substrates, have gone through significant improvements over the past few decades with respect to both their format and their printing materials. Because of their advantageous material properties, such as disposability, simplicity, and rapid responses, SPEs have been successfully utilised for the rapid in situ analysis of environmental pollutants. This critical review describes the basic fabrication principles, the configuration designs of SPEs and the hybrid analytical techniques based on SPEs. We mainly overview the electrochemical applications of SPEs in environmental analysis over the past 3 years, including the determination of organic compounds, heavy metals and gas pollutants. With the help of our dexterous professionals, we are indulged in manufacturing and supplying an excellent quality array Screen Printed Sensor electrodes.The Graphite Nanopowder scrap comes from pieces of unusable electrode material usually after crushing and sizing. Our product is available in different packaging options as per the specific requirements clients. With the help of our dexterous professionals, we are indulged in manufacturing and supplying an excellent quality array Screen Printed Carbon Electrodes – N500.The Graphite Nanopowder scrap comes from pieces of unusable electrode material usually after crushing and sizing. Our product is available in different packaging options as per the specific requirements clients. With the help of our dexterous professionals, we are indulged in manufacturing and supplying an excellent quality array of Screen Printed Electrodes Bio Sensor. The Graphite Nanopowder scrap comes from pieces of unusable electrode material usually after crushing and sizing. Our product is available in different packaging options as per the specific requirements clients. With the help of our dexterous professionals, we are indulged in manufacturing and supplying an excellent quality array of Zensor Screen Printed Electrodes. The Graphite Nanopowder scrap comes from pieces of unusable electrode material usually after crushing and sizing. Our product is available in different packaging options as per the specific requirements clients. With the help of our dexterous professionals, we are indulged in manufacturing and supplying an excellent quality array of Gold Screen Printed Electrodes. The Graphite Nanopowder scrap comes from pieces of unusable electrode material usually after crushing and sizing. Our product is available in different packaging options as per the specific requirements clients. With the help of our dexterous professionals, we are indulged in manufacturing and supplying an excellent quality array of Carbon Screen Printed Electrodes. The Graphite Nanopowder scrap comes from pieces of unusable electrode material usually after crushing and sizing. Our product is available in different packaging options as per the specific requirements clients. With the help of our dexterous professionals, we are indulged in manufacturing and supplying an excellent quality array Custom Screen Printed Electrodes (3-electrodes).The Graphite Nanopowder scrap comes from pieces of unusable electrode material usually after crushing and sizing. Our product is available in different packaging options as per the specific requirements clients. With the help of our dexterous professionals, we are indulged in manufacturing and supplying an excellent quality array Electrochemical Sensor – N300.The Graphite Nanopowder scrap comes from pieces of unusable electrode material usually after crushing and sizing. Our product is available in different packaging options as per the specific requirements clients. With the help of our dexterous professionals, we are indulged in manufacturing and supplying an excellent quality array Screen Printed Sensors – N400.The Graphite Nanopowder scrap comes from pieces of unusable electrode material usually after crushing and sizing. Our product is available in different packaging options as per the specific requirements clients. With the help of our dexterous professionals, we are indulged in manufacturing and supplying an excellent quality array Screen Printed Electrodes -N100.The Graphite Nanopowder scrap comes from pieces of unusable electrode material usually after crushing and sizing. Our product is available in different packaging options as per the specific requirements clients. With the help of our dexterous professionals, we are indulged in manufacturing and supplying an excellent quality array Electrochemical Electrodes – N200 .The Graphite Nanopowder scrap comes from pieces of unusable electrode material usually after crushing and sizing. Our product is available in different packaging options as per the specific requirements clients. 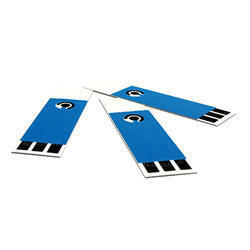 Looking for Screen Printed Electrodes ?